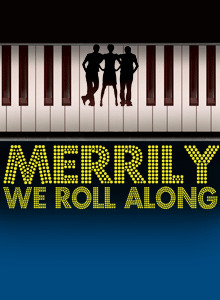 A Follow Spot: "Merrily We Roll Along" Gets Its Miranda Right! "Merrily" has had some interesting casts over the years, aside of course from the vast number of high-school and college productions it gets. The original cast had a leading trio who, however young, would go on to substantial careers: Jim Walton (he eventually got to be the leading man in "Crazy for You" on TV, and I saw him in "Death Takes a Holiday" just last fall), Ann Morrison, and Lonny Price (who's now more active as a director). Jason Alexander played the tone-deaf producer who first hires the guys, and Liz Callaway was back in the ensemble. The 1985 La Jolla production that introduced the main revisions that still stand was directed by James Lapine (also doing the honors for Encores), starring John Rubinstein, Heather MacRae, and Chip Zien, with Marin Mazzie as Beth (Frank's first wife) and Mary Gordon Murray as Gussie, the brazen actress he later marries. Then in 1990 Arena Stage (DC) did it, a production that I saw. It had Victor Garber, Becky Ann Baker, and David Garrison, with Mazzie and Murray returning. In 1994 York Theatre (the East Side operation that also does Musicals in Mufti) had a production, and I believe these were the last of the revisions. Malcolm Gets, Amy Ryder, and Adam Heller were the leads, with Anne Bobby as Beth and Michelle Pawk as Gussie. The 2002 production, part of the Sondheim Celebration that summer at the Kennedy Center, was wonderful in every way, including the cast: Michael Hayden, Miriam Shor, and Raul Esparza, with Adam Heller now as the producer, plus Anastasia Barzee as Beth and Emily Skinner as Gussie. And now for Encores; I'll be there! I wish I had seen them all! But especially the Sondheim Celebration version. Thanks so much for the added information, Jon. I'm afraid I wrote this in a rush because I wanted to put something up about it, and wasn't as complete as I should've been. There was no cast recording from the Kennedy Center production, was there? I have the one from the York production, and it sounds very good, I think. It's intriguing to me that the score includes "Not a Day Goes By" and "Good Thing Going," and yet every time I've seen it, "Franklin Shepard, Inc." is the one that brings down the house. Not that there's anything wrong with "Franklin Shepard, Inc." It just strikes me as a little silly and kind of dated sounding. But I guess it shows that a character song with energy and humor in it will shoot straight to the heart of an audience. I agree that the York production sounds good on its recording. And yes, none of the Kennedy Center productions were recorded. I think that two big reasons "Franklin Shepard, Inc." always goes over so well are that it's a real tour de force for a performer (the feel of a patter song, even though it isn't really -- but it has that energy you talk about, and especially the conclusion is a race against time to say all the words before the final orchestra stinger), and that Charley is the most sympathetic role and is often played by the most likable performer. That was certainly the case with David Garrison and Raul Esparza, and is almost certain to be the same with Mr. Miranda. Casting Lin-Manuel Miranda as Charlie is really a stroke of genius. Yes, David Garrison and Raul Esparza are very, very likable, but in different ways. Miranda has a boyish charm and warmth that is all his own, plus a kind of (fizzy? frenetic?) energy that should make that song, well, sing. Somebody at Encores! did a very smart thing, if you ask me.